I’ve reviewed Jock Cooper before. But for those artists who are multi-talented, I simply have to have multiple reviews. Previously I reviewed Jock Cooper the Innovator; the artist who created surreal machines and leading edge fractal animation in full multimedia. This time it’s Jock Cooper the Old Master; the Spiral-angelo of Fractal Art. If you visit Jock’s website fractal-recursions.com, the artwork of his I’m referring to here is what he has labelled his Traditional Gallery. Traditional — yes, but not cliche or stereotypical. I would simply call it Classical Fractal Art just as music has a Classical category to it. What I like about these works (and almost all of them exhibit the same appealing characteristics) is simply their fractal-ness. The fractal patterns and structures are enhanced by Jock’s extreme skill in coloring and excellent eye for composition. Although there are a whopping 904 images in this section of Jock’s gallery, there are very few that aren’t of high quality. I had a very hard time finding a few to present as the finest examples because there’s simply so many equally good ones there. 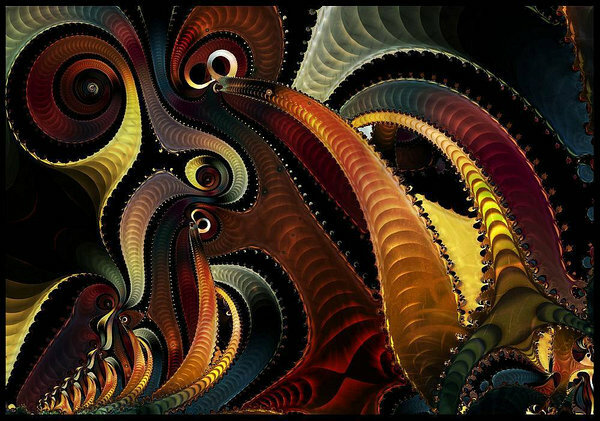 Although I cringe when entering an Ultra Fractal gallery because it usually means witnessing artwork that has undergone death by a thousand layers, Jock’s images rely on the visual power of the fractal algorithms themselves and that’s why I think he’s been able to produce such great quantity and still maintain such great quality. Jock embellishes and enhances the fractal imagery but lets it keep it’s natural form and architecture. It sounds simple, but there’s very few fractal artists like Jock who seem to be able to do this or for that matter, even try. 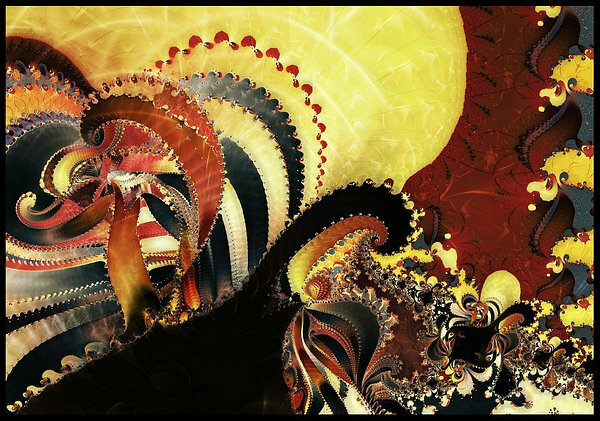 Jock’s work is a great tribute to what Ultra Fractal can do when used creatively instead of imitatively. The coloring is often astounding. No doubt due in part to Ultra Fractal’s sophisticated coloring methods as well as Jock’s expertise in working them. Glowing but subtle; metallic but not cheap and shiny; colorful but never garish; refined but not bland; classy but not pretentious; muted but still energetic; classical yet new and different. I noticed something else while browsing the entire collection from beginning to end; Jock wasn’t always the Spiral-angelo that he is today. If you view the galleries in sequential order you’ll see the development of Jock’s style over the years and gain some appreciation for the fact that just like every other form of art, fractal art gets better when people practise it longer and get comfortable with experimentation. I think if you wanted to introduce someone to the wonders of fractal art and not just to some flashy eye-candy, you couldn’t go wrong by directing them to Jock Cooper’s Traditional Gallery. 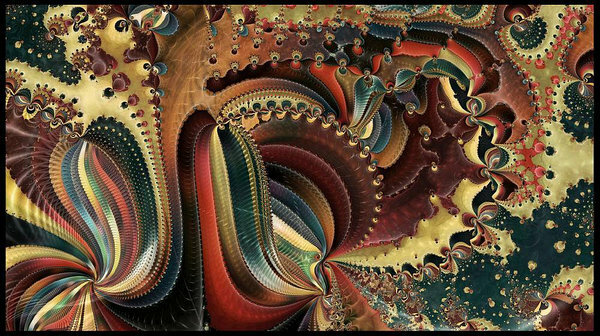 The intensity of detail; the wild, unleashed creativity of fractal math; the broad panoramas; and the delightful shock of stumbing on an alien world — all these themes that traditionally characterized Fractal Art are vividly represented here. So whether you’re new to the whole Fractal Art world or someone who thinks they’ve seen it all, if you haven’t checked out Jock’s Traditional Gallery then you’re in for a great discovery — or re-discovery — of Fractal Art in it’s classical style. I am an instant fan. Gorgeous is an understatement. The Mechanical section is mindblowing as well. Indeed, I am a newbie fractal artist and Jock is a great inspiration to me.